My Mom used to say, "there are only two kinds of people in the world: those who are Irish, and those who wish they were"! My ancestors were from Ireland, so St. Patrick's Day was always noted in my house. Today is a day to be Irish, no matter what your ancestry might be. If you also happen to be a knitter, it's an extra reason to celebrate. 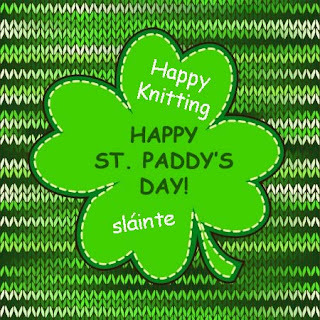 Just think of all those beautiful Celtic designs and cabled Aran garments for starters. So beautiful.. Here is one site I'm particularly fond off: Aran Market. It's eye candy! I bought a kit for the Donnelly aran (my Mom's maiden name) from them years ago and was very pleased. Don't ask me if I've made it yet. It's "aging" like fine wine! Many years ago I was in Ireland and was surprised that I didn't find much yarn but I did discover the Blarney Woolen Mills and some wool, which came home with me. There may be more yarn these days, or maybe I was looking in the wrong places. When I think of Ireland I think how green the country is, the wonderful music and how very friendly I found the people to be. If you haven't been to Ireland, I would suggest that you go if you can. If you're also a knitter, I have another suggestion as well. Last September I went to Scotland and the trip was organized by Jean at Celtic-Journeys. It was FABULOUS. Every detail was well taken care of. It was a trip of a lifetime. The leader of our group was Amy Detjen. This September she is taking a group of knitters to Ireland. I was going to attach the .pdf of the itinerary but I don't see how to do that in Blogger. Sooo....if you're interested (there are a couple of spaces left) - go here and have a look and download the itinerary from the Celtic-Journeys website. If you contact Jean directly, her email is: jean@celtic-journeys.com and tell her that Joanne sent you! Does this sound like a commercial? I'm okay with that. I like to pass on good information from time to time. ...and the 'Top of the Mornin' to yourself! Erin Go Bragh and all that!